The statistics say it all. 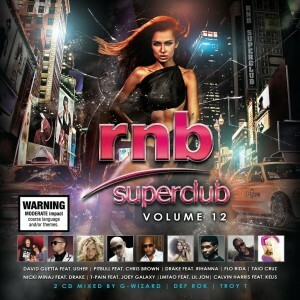 With volume twelve about to hit the stores, the ‘RNB Superclub’ compilation series has so far sold over half a million copies across the country throughout the past decade. And with some of Australia’s and the world’s hottest R&B stars featured among the tracklisting for the new volume, that figure looks to be added to big time. Discover J-Lo, Ke$ha, Keri Hilson, T-Pain, Wiz Khalifa, Nicki Minaj, Kelly Rowland, Lloyd, LMFAO, Usher, Taio Cruz, Flo Rida and Pitbull just to name a few. Then sprinkle in some of the finest local urban talent in Timomatic, Havana Brown, Jess Mauboy, 360, Israel Cruz, Stan Walker and Marvin Priest and you’ve got yourself a fine compilation. The 44 track double CD set is ready to drop on Friday July 06.